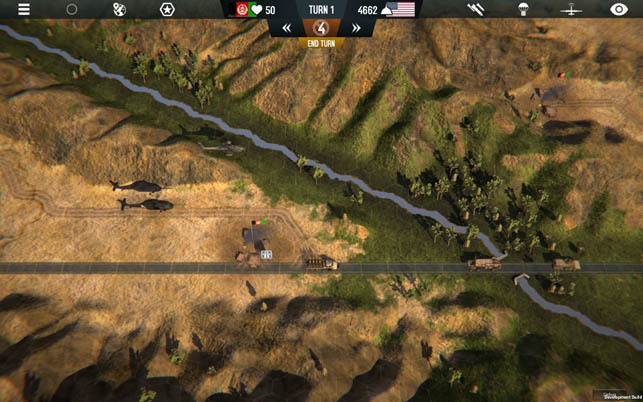 Using turn-based gameplay, Afghanistan ‘11 (Developer: Every Single Soldier) simulates the hardships of regular troops facing insurgents in guerilla warfare. While popular titles of the genre encourage the player to steamroll and expand their territory quickly, the emphasis in this title is on securing small gains. The tedium of the gameplay -- consisting of fighting an elusive opponent, managing public opinion, and political strategizing -- conveys the real atmosphere in the Afghan theater of conflict around 2011. This realism, however, comes with the gameplay challenge of keeping repetitive tasks entertaining and not letting the tedium overpower the game experience as a whole. The player has the option of playing campaigns with specific objectives, or skirmishes where the only goal is to stabilize the region and drive out the insurgent forces. When I began to play, I was taken aback; acquainted with games from the Civilization or Total War series, I moved my troops all over the map to look for insurgents. I lost after four turns: My MRAP vehicle ran out of fuel, my Blackhawk crashed, my Marines were out in the field starving, and I was not able to buy supply vehicles to rescue them because I did not have the necessary political backing from Washington. I reviewed the tutorial again and began to play more carefully. I realized you cannot send troops on a mission without plans for how to sustain them. A supply vehicle has to be able to reach them from the base any time their fuel runs out. My second foray went better -- I lost after eight turns. The reason for my repeat failure was what sets Afghanistan ‘11 apart from other turn-based strategy games: I was fighting the opponent without the support of the local population. Necessary support is earned by visiting villages, delivering UN aid, and building structural improvements -- peaceful, constructive actions which raise the “Hearts and Minds” score. That, in turn, decreases the attacks by the insurgents and offers the possibility of bonuses. Although I was improving, I became frustrated. The micromanagement involved is staggering. In this release, it feels like Every Single Soldier really makes you manage every single soldier. Additionally, there is pressure to keep the local population happy, and to secure support of US public opinion, and, on top of all that, the Taliban seemed to always undo my progress immediately. Three steps forward, two back. As I was sulking and feeling like everyone’s punching bag, I realized: this is what it must have felt like to command a base in Afghanistan! The humdrum and sometimes thankless work required of troops and their commanders in Afghanistan is familiar from media reports and documentaries. As a video game, Afghanistan ‘11 is effective at conveying interactively distrustful civilian populace, public opinion at home that’s critical of any setback, and the frustration of facing the constant threat of attacks by guerrilla forces who then retreat to their hideouts. I started over again. This time much, much more scrupulously. I only bought the most necessary units, and I moved my vehicles such that they would not get stranded due to lack of supplies. I sent them to villages and engaged the local populace -- and see there; I was winning the hearts and minds of the Afghans and the support of public opinion. That, ultimately, enabled me to fight the insurgents more efficiently. Finally, I was able to finish the campaign. Turn-based strategy games in general struggle with the issue of how to entertain the player. The movements in turns over hexagonal tiles are an abstract concept. Thus, such games rely on work done by the player’s imagination as he suspends disbelief and accepts the hexgrid and the events within as “real.” The player needs to contribute actively to his own entertainment entertained. In the case of Afghanistan ‘11, the ‘fun’ lies in being ready to grasp how troops in Afghanistan struggled with guerrilla warfare in 2011. Expository introductions before each mission referencing real historical occurrences offer context and contribute to the immersion into the scenario. However, what the narrative setup promises is not held up by what the player sees on the screen. The sprites don’t show much variation and appear sterile. The animations for each movement are identical and keep the player out, when they should help draw her in. 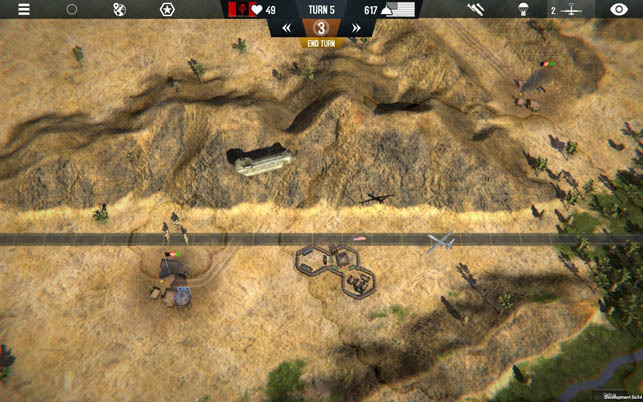 After repeating the same menial clicking task for the hundredth time, the intent to convey the experience of commanding a base in Afghanistan misses its target and throws the player out of game flow. The attention to detail in the game mechanics, the developers’ efforts to maintain relevance and historical accuracy, and the rewards of mastering its intricacies set Afghanistan '11 apart as an exceptional title. However, an unusually steep learning curve, which might be hard to accept for someone who wants to casually try a turn-based strategy game, keep this release from broader appeal. Afghanistan '11 requires a sustained interest in either the historical subject matter or turn-based strategy games, promising little to those who aren't history buffs or part of the wargamer scene.